Raise your hand if your parents had 'the talk' with you. No, not that talk. We mean the money talk. Money affects you and your kids every day. Now there's a way to talk about money in a way that actually brings your family closer. With two kids of our own, we suspect our parenting goals are likely the same as yours—no spoiled brats, no crippling debt, and kids who know a dollar actually takes work. That's why we wrote this book. 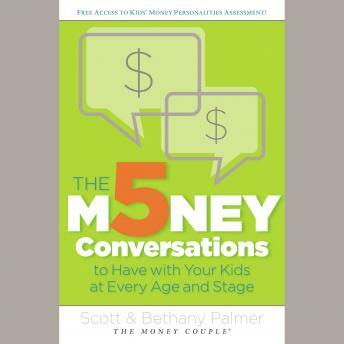 The 5 Money Conversations to Have with Your Kids at Every Age and Stage offers practical advice for dealing with three age groups (5–12, 13–17, and 18 and beyond). It is the parenting 'how to' book you don't want to live without.Conquer the 5 toughest money conversations to have with your kidsDiscover your kids' Money Personalities by taking the age-based Money Personalities Assessment (access code included inside)Learn their Money Languages so you can be heardWe give you relationship secrets, share our experiences, and make it fun. Whether your kids are 5 or 25, this book will change the course of your family forever!